To complete a custom element for a home, apartment building, or commercial space, we turn to our network of craftsmen and artisans. These craftsmen/artists understand design theory, environmental issues, ergonomics, functionalism, and visual aesthetics. To create unique pieces they employ both contemporary and old world techniques. We work directly with the these skilled tradesmen providing the specs for the project and the overall design scheme. While a beautifully designed private residence or office space makes for a better environment for those occupying the space, custom elements set the tone for opulent style. Adding custom elements to a space, such as shelving to showcase a personal collection, create unique focal points. 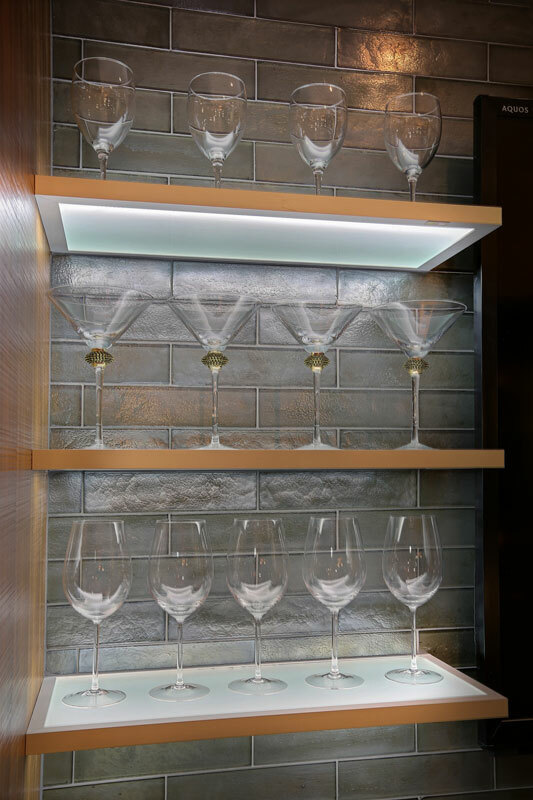 These custom shelves frame the space around a mounted television providing ambient lighting and glassware display. Shelves are frosted glass with extruded aluminum edges. View our design gallery for examples of custom elements we’ve created for our clients. For a consultation on your next design project, please send us an inquiry through our online form or call us at (303) 489-9958. We are eager to start working with you!